Monklets are predefined code snippets that allow you to bring in other module content (sermons, events, etc.) into your pages. There are a few monklets that have been created that are placed in sections that you can assign to various sections on your site. 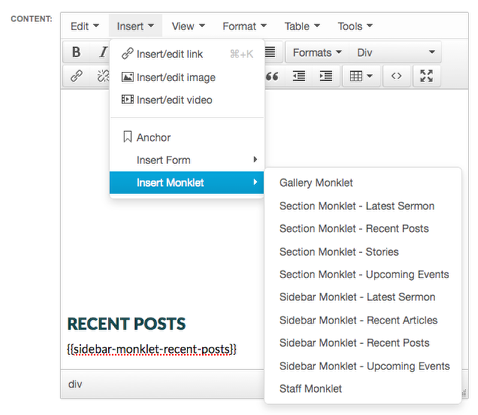 You can use a monklet inside a section by placing your cursor in the content area, selecting Insert > Insert Monklet > "Desired Monklet". Monklets allow inline parameters to be passed to define items from a specific group, category, etc. http://help.monkcms.com/article/using-monklets/ provides details on using these parameters. Sidebar Monklet - Latest Sermon: Displays the most recent sermon. Sidebar Monklet - Recent Articles: Displays the 2 most recent articles. Sidebar Monklet - Recent Posts: Displays the 2 most recent blog posts from all blogs. Sidebar Monklet - Upcoming Events: Displays the 3 most recent events.